...a Tornado Warning Remains In Effect Until Midnight Cdt For Northwestern Sabine Parish...southeastern Shelby And North Central Sabine Counties... At 1142 Pm Cdt, A Large And Extremely Dangerous Tornado Was Located 9 Miles East Of Patroon, Or 23 Miles Southeast Of Center, Moving Northeast At 50 Mph. ...Read More. 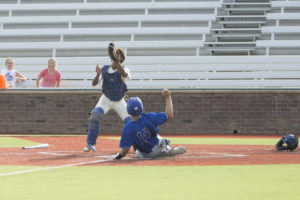 TYLER – After a one-run loss in Game One of their best-of-three series with the Union Hill Bulldogs, the Slocum Mustangs bounced back to win Game Two by a score of 8-5. Unfortunately for the Mustang fans, Game Three went to the union Hill Bulldogs by the score of 8-5 to bring Slocum’s season to a close. Taylor Hunt got the start for Slocum in Game Two and after a lead-off walk to Union Hill’s Gabe Nelson, Hunt retired the next three batters he faced. The Bulldogs sent Seth Engle to the mound for the start of Game Two and like Hunt, he only allowed one base runner in the first inning when Joe Byrnes lined a pitch into center field for a base hit. Hunt struck out the side in the top of the second while Engle only gave up a single to Andrew Abernathy to send the game into the third inning. Hunt retired Adam Kuza to open the third and then gave up back-to-back singles to Carl Fletcher and Gabe Nelson. Colton Wade was rung up for the second out of the inning but a walk to Trevor Tidball loaded the bases. A second walk to Nick Rickman pushed Fletcher across the plate and a fielding error scored Nelson from third to make the score 2-0. The Slocum defense regrouped after the second run scored and Hunt caught Colt Mallory looking at a called third strike to end the top half of the inning. After going in order in the bottom of the third, the Mustangs cut the lead in half when they came to bat in the fourth. An error along with back-to-back walks allowed Colton Peters to cross the dish with Slocum’s first run to cut the lead to 2-1. 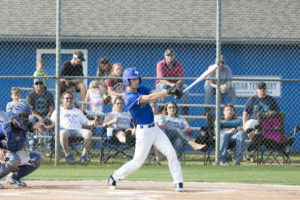 The fifth inning saw some offensive fireworks as the Bulldogs tacked on two runs only to see the Mustangs put up a five-spot to take the lead 6-4. With the score 4-2 in the bottom of the fifth, Hunt led off with a triple and scored on an error. Byrnes followed with a hit and moved to third on a double from Peters. Byrnes was thrown out at home but Taylor Lomax followed with a double to score Peters. Dustin Fletcher followed with a double of his own to plate Lomax and tie the game at four. 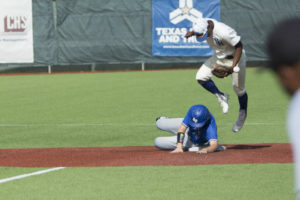 An error on the next play allowed Abernathy to reach first and then take second as well as third while Fletcher scored to give Slocum their first lead of the game. A passed ball gave Aber nathy the chance to scamper home with the Mustangs’ fifth run of the inning and made the score 6-4. The Mustangs added two more runs to their total in the bottom of the sixth as Byrnes and Peters reached and came around cross home plate thanks to errors on the part of Union Hill. 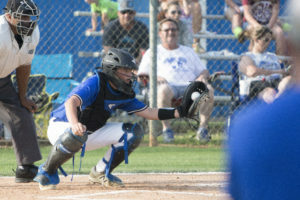 The Bulldogs plated a run in the bottom of the seventh but it was to little too, too late as the Mustangs won Game Two by a final score of 8-5. Game Three of the series started approximately 30 minutes after Game Two and the Bulldogs sent Kasen Yandle to the mound. Yandle managed to work around a hit batsman to keep the Mustangs in check in the top of the first and then turned it over to his offense. Fletcher got the Game Three start for Slocum and after walking Nelson to open the bottom of the first, he struck out the next batter he faced. A fielding error and two stolen bases by Nelson gave the Bulldogs a 1-0 lead after one but the Mustangs tied things up in the bottom of the second. A walk to Fletcher followed by a hit to Abernathy gave the Mustangs runners at first and second with no outs. 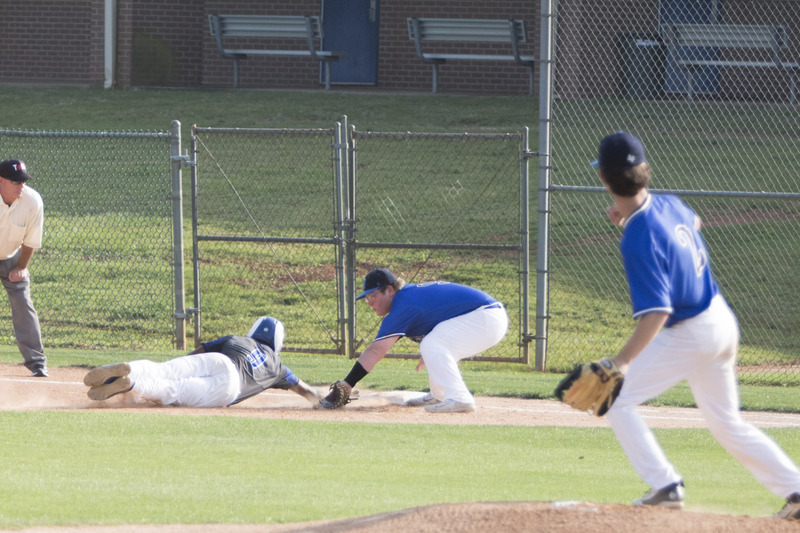 After a strike out of Kyle Garman, two consecutive passed balls allowed Fletcher to move from second to third and cross the plate to tie the game at one. The tie score didn’t last long, however, as Slocum ran into trouble in the bottom of the third. Julian Williams walked, Yandle was hit by a pitch and Wade laced a single into the outfield to score Williams. Mallory grounded out but on the play, Yandle was able to cross the dish to make the score 3-1. 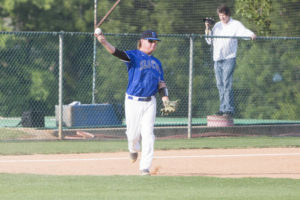 Wade moved to third on the throw and when Fletcher grounded out, Wade scored the third run of the inning for Union Hill. The Bulldogs doubled their run production in the bottom of the fourth as they added four more runs to make the score 8-1 as he game headed to the fifth inning. After a Randy Guess struck out to open the top of fifth, Hunt walked and stole second and third. Byrnes also walked and when he stole second, a throwing error allowed Hunt to cross the plate. Walks to Peters, Lomax and Fletcher pushed Byrnes across the plate and made the score 8-3. Abernathy was hit by a pitch and brought Peters home. Garman was up next and grounded out to first. On the play, however, Lomax scored to tighten the lead to 8-5. That was as close as the Mustangs would get as the Bulldogs hung to win the game 8-5 and the series 2-1. Previous articlePart Two: Simply the Best!